I've been thinking about a simple and contemporary way to add a little Easter decoration to my home as I don't really want bunnies and eggs everywhere! 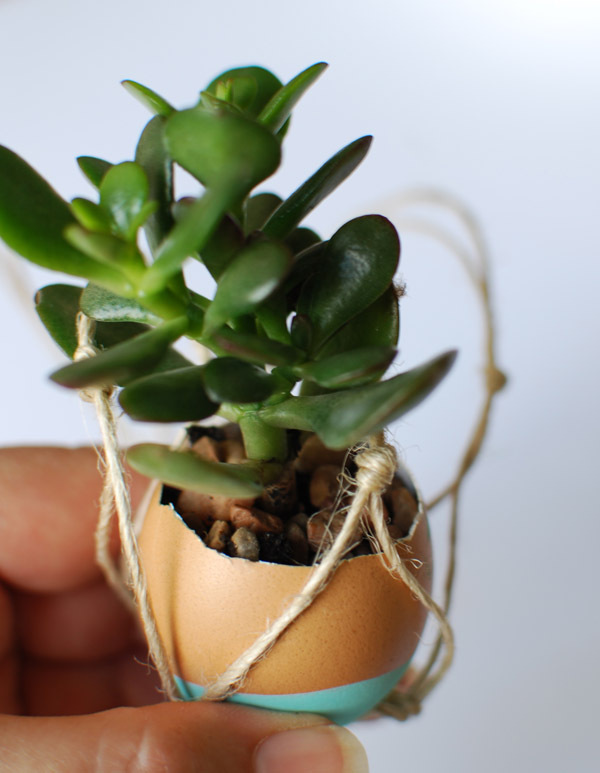 These mini succulent egg decorations fit the bill nicely for me with a bit of macrame, some dip-dying, cute succulents, and of course eggs. 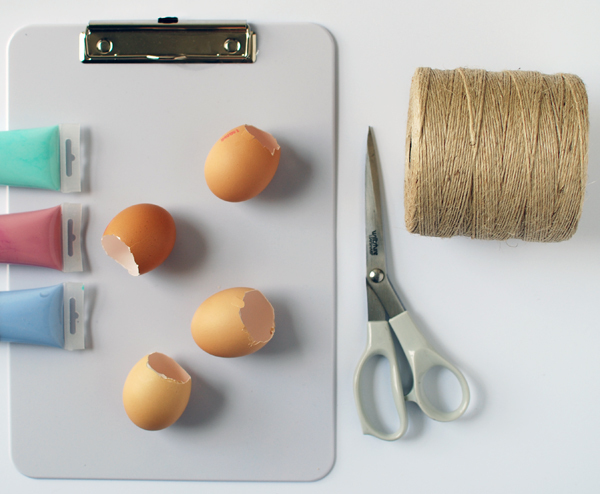 Crack open the uncooked eggs by tapping a few times to crack the shell, then cut through with a serrated knife. Position the cut so you remove the top quarter of the egg shell. It's a good idea to cut a couple of extra shells just in case they break. 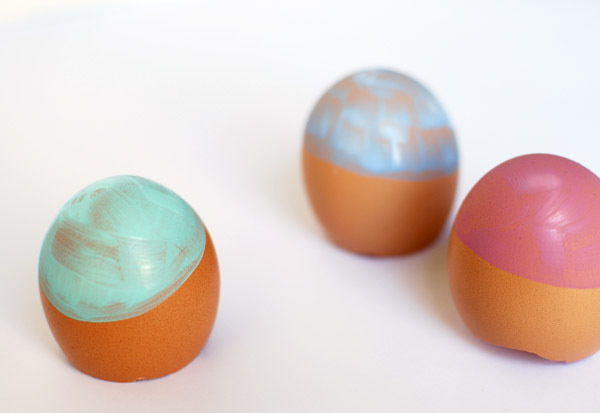 Tip the eggs into a bowl and wash inside and outside of the shell in soapy water. Set the shells aside to dry and make yourself an omelette. When the shells are completely dry, paint the bottom section in a solid colour. You'll need two to three coats of paint to achieve an opaque finish (the photo below shows how they'll look after only one coat). 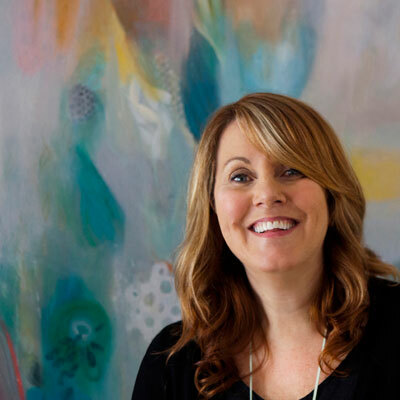 Allow the paint to dry between coats - you can use a hair dryer to speed things up. 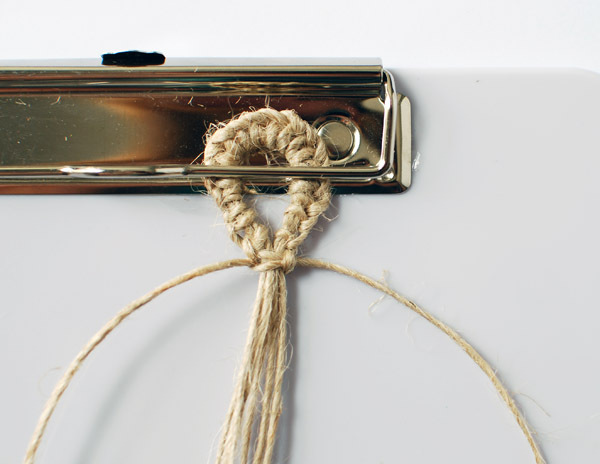 Set the painted shells aside while you make the macrame hangers. Cut three lengths of jute measuring 130cm (51 inches) and one piece measuring 160cm (63 inches). Note: if you are planting a tall cactus, add an extra 20cm (8 inches) to these measurements. 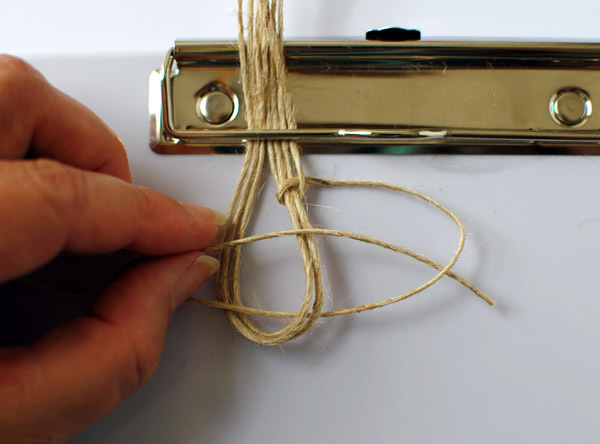 Align the ends of all pieces and fold the three shorter pieces in half. 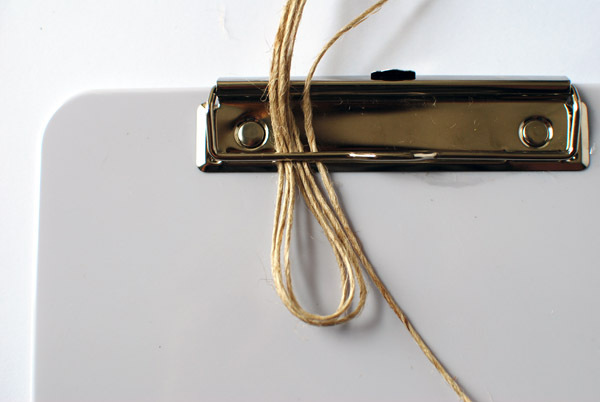 Secure the jute on the clipboard as shown below. One end of the long piece will remain unsecured. 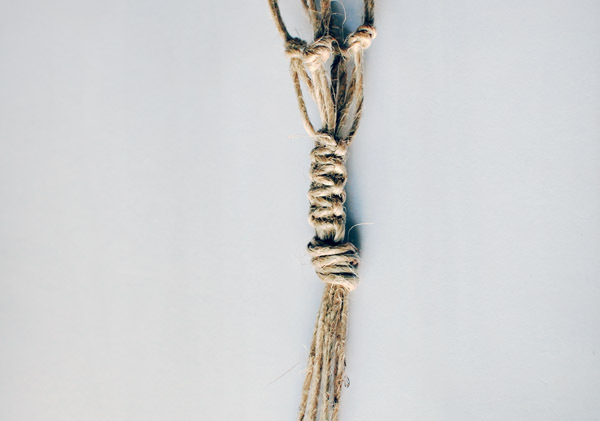 The hanging loop is created by tying a series of the same knot. Then pass it back over the three pieces and down through the loop. Pull the knot tight. Repeat. Continue until you have tied 20 knots. Remove from the clipboard. 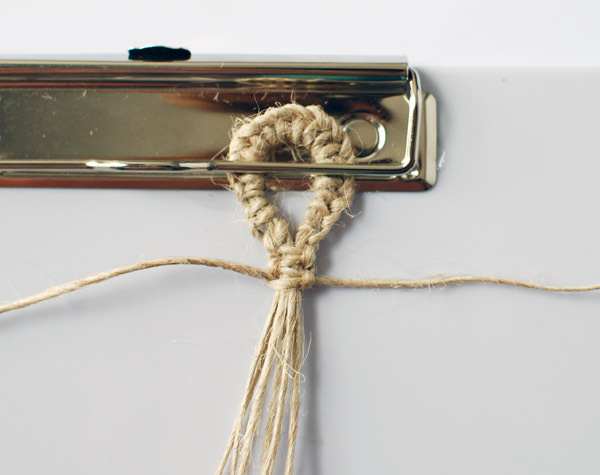 Secure the knotted loop to the clipboard. 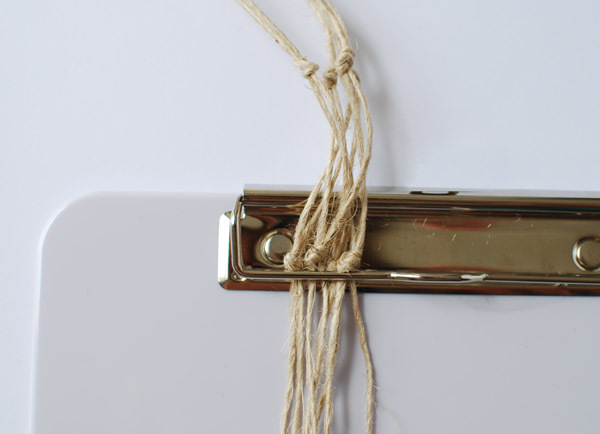 Take the piece of jute on the far right hand side and pass it over all the central pieces, then under the piece on the far left. 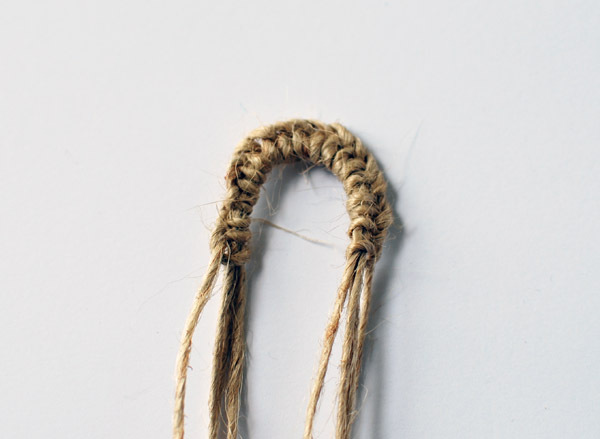 Take the piece of jute on the far left-hand side and pass it under all the central pieces, then up through the loop and over the piece on the far right. Pull the knot tight. That completes half the first knot. 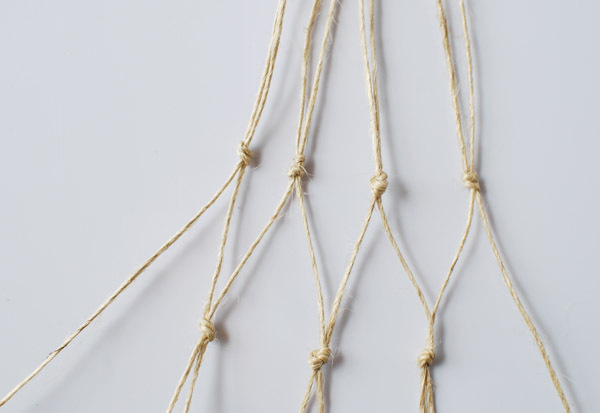 The second half of the knot repeats the process, but you start with the left-hand piece first. Take the piece of jute on the far left-hand side and pass it under all the central pieces, then over the piece on the far right. 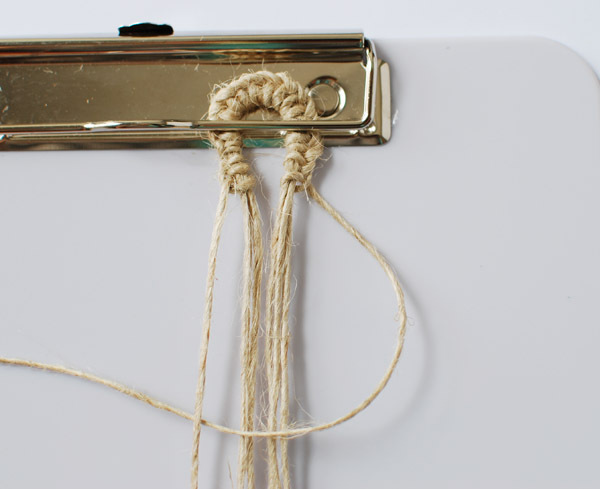 Take the piece of jute on the far right-hand side and pass it over all the central pieces, then up through the loop and under the piece on the far left. Pull the knot tight. 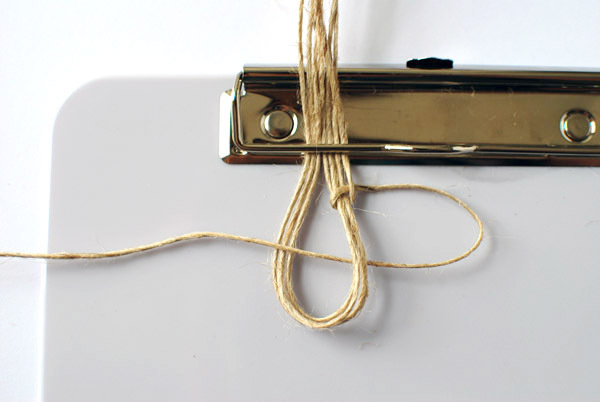 That completes one knot, and it will look like the photo below. Now tie another complete knot. 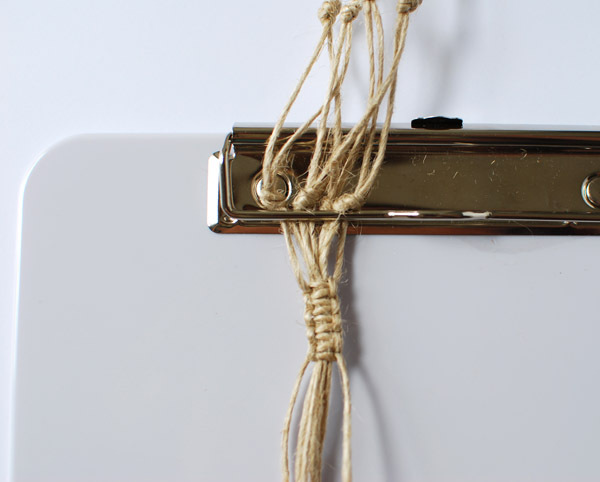 Bring the two outer pieces of jute down so they are parallel with the others. 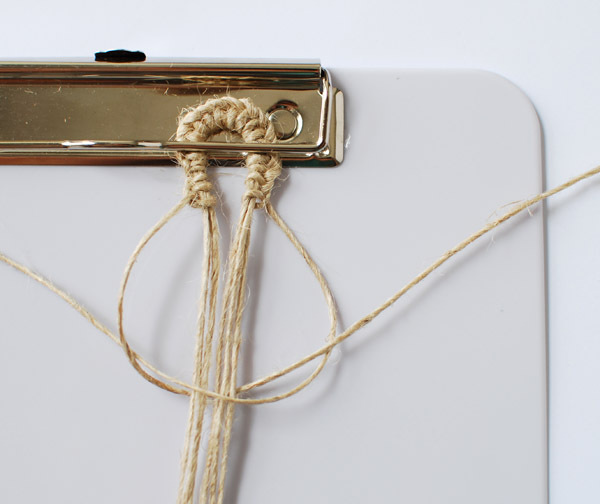 Divide the jute into four groups of two, making sure you group pieces that are next to each other. Measure 18cm (7 inches) down from the secured loop and tie a knot in each group. Divide the the groups again, making sure you group pieces that are next to each other. Measure 5cm (2 inches) down from the knots and tie a knot in each group. Start with the three central groups, as in the photo below, then tie the two outer pieces together. 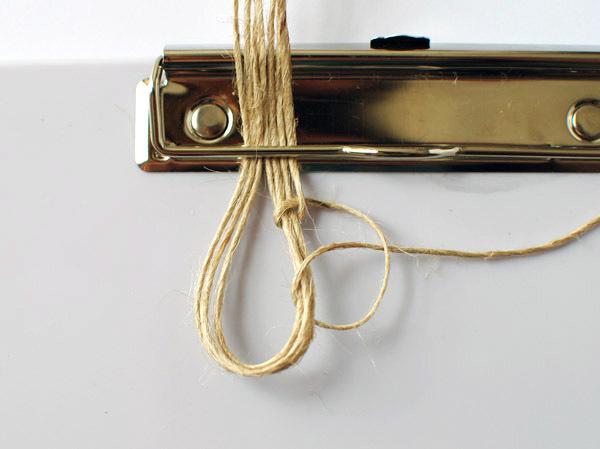 Move the jute up on the clipboard so that the last group of knots are just above the clip. 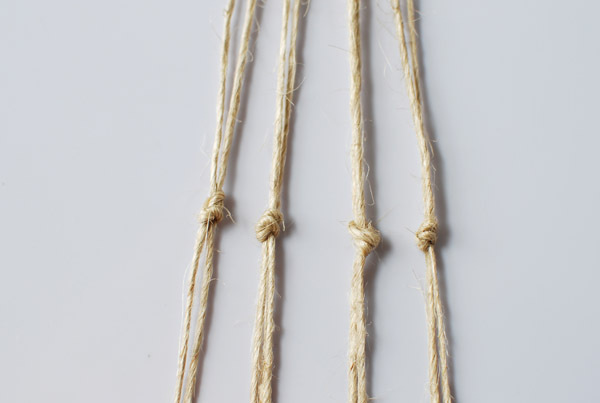 Starting 2.5cm (1 inch) down from the knots, tie four knots using the instructions in step 4. 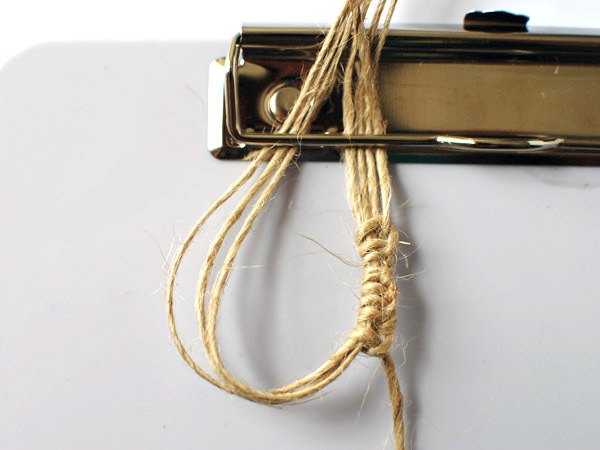 To finish off, tie a knot with all the pieces of jute. Cut the ends so you leave a tassel of about 15cm (6 inches). Carefully plant the succulents in the egg shells. Open up the basket and place the egg inside. 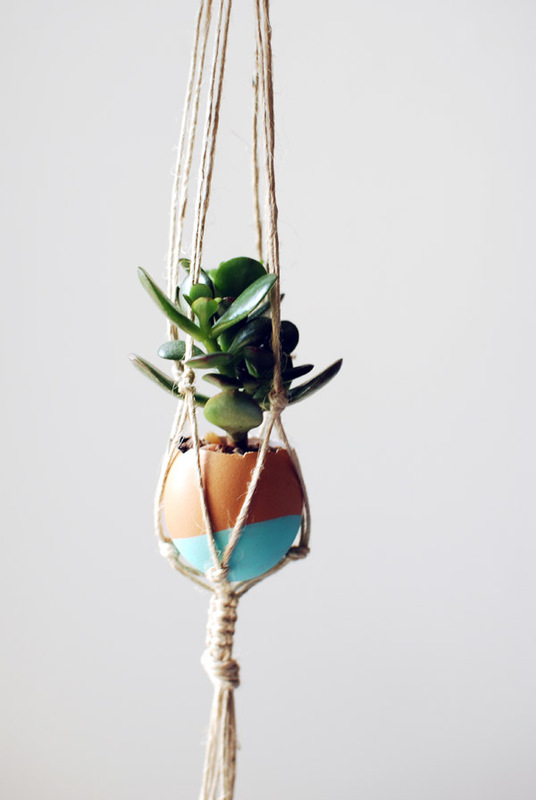 Hang your mini succulent egg decoration while you make some more. These egg decorations are light enough to hang on the smallest 3M removable hooks, so they'll be easy to take down after Easter - but they look so cute I'm just going to leave mine up! Have you started making anything for Easter? We'd love to hear your plans - tell us in the comments section below.